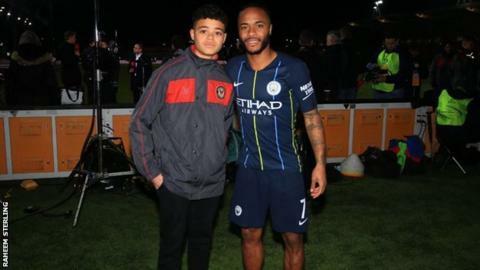 Manchester City forward Raheem Sterling has met a young fan he wrote to after the teenager was racially abused. Sterling, 24, wrote a letter to Ethan Ross after the boy's grandmother revealed he had been having a "tough time" because of the abuse. He met the Newport County academy player after City's FA Cup fifth-round win at the Welsh side on Saturday. "It was probably as heartwarming for me as it was for you to finally meet up, Ethan," Sterling said on Twitter. "Again, always be proud of who you are, and never stay silent. #SpeakUp #youthsarethefuture." Sterling was an unused substitute as City beat County 4-1 in Wales to reach the quarter-finals. He has been the victim of abuse himself, the most recent incident being alleged racist abuse in a game at Chelsea in December. In the aftermath of that incident, he said newspapers "fuel racism" by their coverage of young black footballers.